[Haropani☆Pumpkins and the Strange Wild Hunt] begins. New Skill Effect [Drain] added. Certain skills will have the effect [Drain] activate when attacking. When the [Drain] effect activates, the character will recover a certain amount of HP depending on the damage dealt. 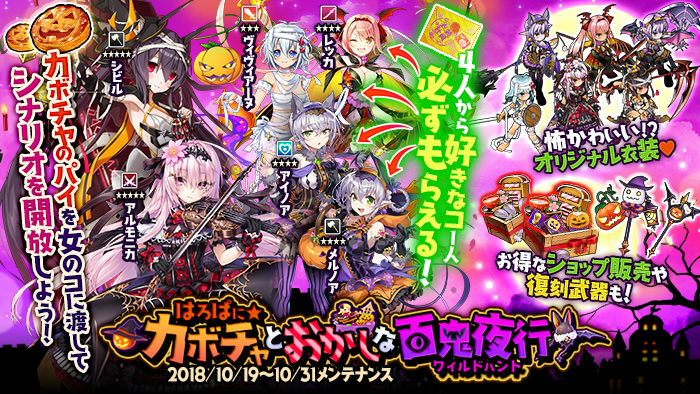 This time, the Costume Employee [Halloween] Sibylle's skill will have this effect. The ★5 Costume Employees have increased resume rates. 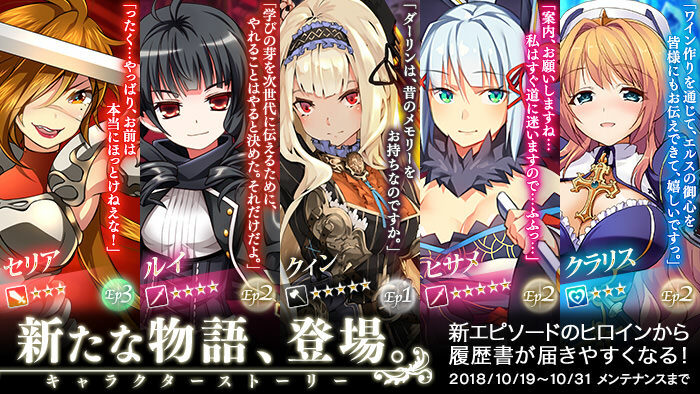 ※ The above 6 employees will only appear during the [Haropani☆Pumpkins and the Strange Wild Hunt] event and will have resume appearance rates higher than normal employees. Furthermore, using the [Limited] Candy Postbox will increase these chances. 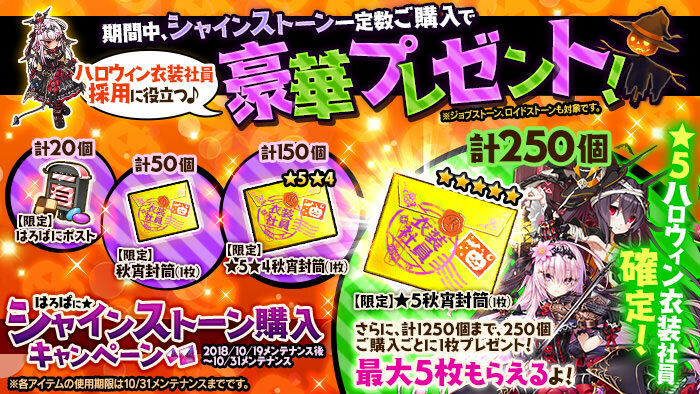 ※ The above 6 employees can be recruited from the rewards received from the [Haropani☆Shinestone Purchasing Campaign]. 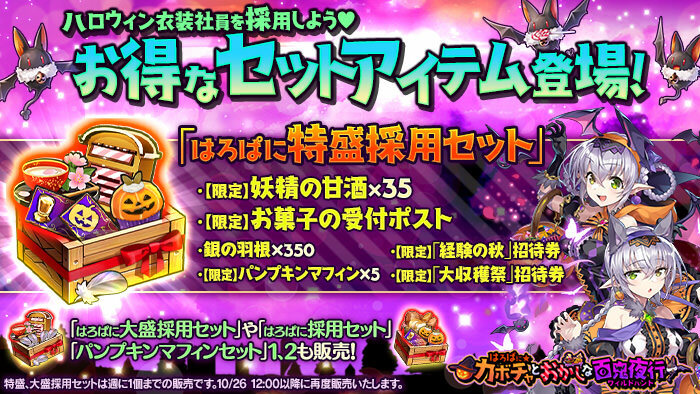 ※ After the limited period, the above Costume Employees' resumes will no longer appear. ※ [Costume Employees] cannot use Mirrors of Transformation to change their costume. ※ [Costume Employees] are not affected by Public Relations Department's class recruitment bonus. 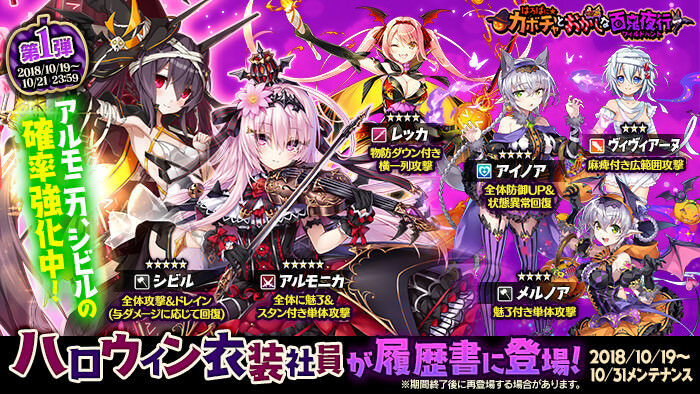 ※ [Costume Employees]' character stories' exclusive equipment differs from that of their normal or EX variations. - Each story can drop related items for this specific employee. Today's update brings the following Character Stories. ※ Until the 10/31 (Wed) maintenance, the above employees will have an increased resume rate. Other story episodes are planned for future updates. In addition, the following costume employees have had character stories added. Fixed a bug where Formations could have frontline and backline employees stack ontop of each other unnaturally. Fixed an issue with certain event weapons and Erika's exclusive weapon having unintended stats. The following employees have had their resume rates returned to normal. There is maintenance for an update planned for the following time frame. While maintenance is occurring, [Kanpani☆Girls] will be unavailable. ※Maintenance ending time is subject to change. Last edited by Folseus; 10-19-2018 at 07:12 AM.